This class is designed to reinforce the basic lessons of Color Awareness and bring the color wheel to life. We will work with polymer clay…starting with the three primary colors…and create our own ‘color wheel.’ As we work, we will analyze our sample points and consider the implications of picking our primaries and creating a mixing protocol. The color samples made in this class can be formed into simple beads and strung to make a gorgeous necklace, which can also be used as a reference tool!!!! This is a five hour class. Color Awareness is NOT a prerequisite for this class and no previous experience with polymer clay is required! Tools for working with polymer clay will be available for use during class. 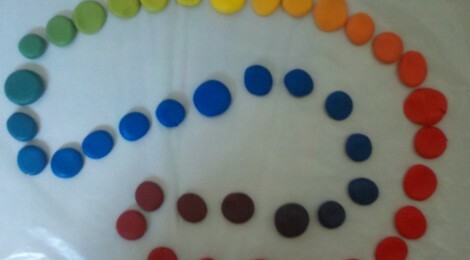 Bring: Polymer clay…pick three colors, one red, one blue and one yellow. You will need 3 2 oz packages of each of these colors. I recommend Premo or Kato brands. However, if you have a favorite brand, go for it. (Contact the instructor if you have questions about the polymer or other supplies/materials needed for this class). You will also use 1-1½ inch cutter...any shape, fine tip permanent marker, S-Lon stringing thread, scissors and all the usual stuff including pasta machine (if you have one) and cutting blade.